Longwear Surface Treatments is a company dedicated to providing a single process: NITRIDE HARDENING. Its very specialisation is its primary strength. More, probably, than any other form of heat treatment process, successful nitriding demands a combination of traditional craftsmanship and technology. Many heat treatment companies boast the latest technical innovations but few provide the focus and attention to detail a nitriding specialist can provide. Our reputation has been built by word of mouth, not by an extensive salesforce. Launched in 1992, Longwear Surface Treatments was formed, dedicated to providing a specialised service exclusively in the nitride hardening process. The company was set up with newly commissioned plant, designed and manufactured to the exacting standards demanded by the company's founder. The former MD and founder of Longwear Surface Treatments, Ian MacDonald, has spent all his working life in the heat treatment industry. His career has embraced most aspects of steel heat treatment, latterly specialising in nitriding prior to forming Longwear Surface Treatments. The current MD George Coward has also spent the majority of his working life in the heat treatment industry. Previous experiences ensured that from the outset, quality systems were put in place to comply with, or exceed industry standards. This facilitated a relatively easy and rapid accreditation to the ISO 9002 quality standard by 1994. Metal forming and plastic moulding industries – including moulds, forging dies, extrusion sleeves and dies, plastic mould tools, injection mould pouring bushes, aluminium extrusion dies, also car body and white goods forming dies. 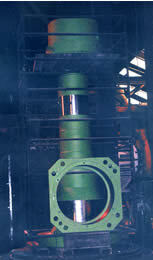 Heavy power generation industry – mainly valve and gland parts, large turbine gears and ancilliaries. Metal machining sector – work/tool holders and carriers for carbide tips. Longwear Surface Treatment's management style is very much "hands on" and always will be. Our experienced workforce is constantly preparing, loading, handling and packing, high value components for nitriding. We process all forms and sizes of components, from single items to production runs.